Atlantic Beach Country Club, Melkbosstrand, Cape Town offers unforgettably enjoyable, facilities throughout all four seasons of the year. Our 18 hole, links style golf course is undeniably stimulating, yet all golfers, from the novice to the pro, thoroughly enjoy this beautifully designed and impeccably maintained golf course. Whether you’ve built a serious appetite after your round of golf, or if you’re simply wanting to enjoy some outstanding quality food and great company. The most magnificent location in Cape Town, Atlantic Beach offers 3 beautifully appointed, world-class conference and function venues and 2 meeting venues. In keeping with the philosophy of relaxed, comfortable and coastal living, guests at The Lodge may take full advantage of all the amenities on the Estate. The developers of Atlantic Beach Estate established a top class family leisure facility next to the driving range and golf academy. Property World Atlantic Beach is an estate agency exclusively dedicated to the selling of houses and land at Atlantic Beach Estate and is a branch of the Property World group. With its impeccably maintained, 18 hole, coastal golf course which features the most spectacular views across the Atlantic Ocean and the historic Robben Island through to Table Mountain, Atlantic Beach is without question, one of the top golfing destinations in Cape Town, and indeed, South Africa. Open all year round and offering stimulating play throughout all seasons, Atlantic Beach offers superlative golfing for everyone from the novice, to the pro. Our members of Atlantic Beach Country Club enjoy an immaculate 18 hole, par-72, coastal golf course with the most breathtaking scenery in Cape Town and have unlimited access to our 5 Star facilities. 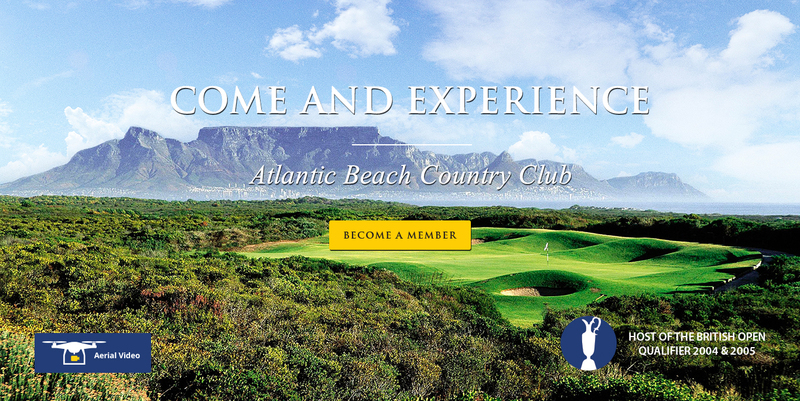 Atlantic Beach is open throughout all seasons of the year and offers an invigorating range of seasonal conditions which promise to inspire both guest golfers and club members alike, all through the year. Let us know how we can be of service to you. Looking forward to hearing from you.